The Wireless Tool of the Linksys Smart Wi-Fi allows you to configure and manage the wireless settings of your router from anywhere. The settings that you specify here are what you will need in order to connect to the wireless network. Under the Router Settings menu, click on Wireless. You can now configure the Wireless Tool according to your preference. The Wireless Tool lets you gain access and control over the following wireless tabs. Choose whichever is applicable in your network setup. NOTE: The Smart Connect feature is only available on supported routers. The Wireless tab contains the wireless settings that you can specify or modify to protect your wireless network. Changing it has been made easy and convenient as you can update the settings remotely using the Linksys Smart Wi-Fi. For video instructions on how to change the wireless settings through the Linksys Smart Wi-Fi, click here. NOTE: The options may vary depending on the version of your router's firmware. Network Name (SSID) / Network name - This is the name that appears on the list of available wireless networks on your wireless computer or devices. Password - This is required when connecting computers or devices to your wireless network. It prevents intruders and other unwanted users from accessing your wireless network. The Password is case-sensitive. Network mode - This is the wireless standard that your network supports. The recommended method is to leave it on Mixed. Security mode - This is the wireless security type. This also determines the kind of encryption that your network will be using. The available options are on the drop-down list. Channel width - The preferred setting is Auto. However, you can change the value depending on your wireless devices in the network. Broadcast SSID - The default setting is Yes. Choosing the No option will prevent other users from detecting your SSID. The MAC Filtering feature allows you to filter wireless users through the MAC Addresses of their computers or devices. You can either allow or deny specific MAC Addresses to access your network. You can use this option to protect your network if you do not want to key in a wireless security password once you connect to your network. However, if you prefer to key in a password while the MAC Filter is Enabled, you can have both security features enabled at the same time. 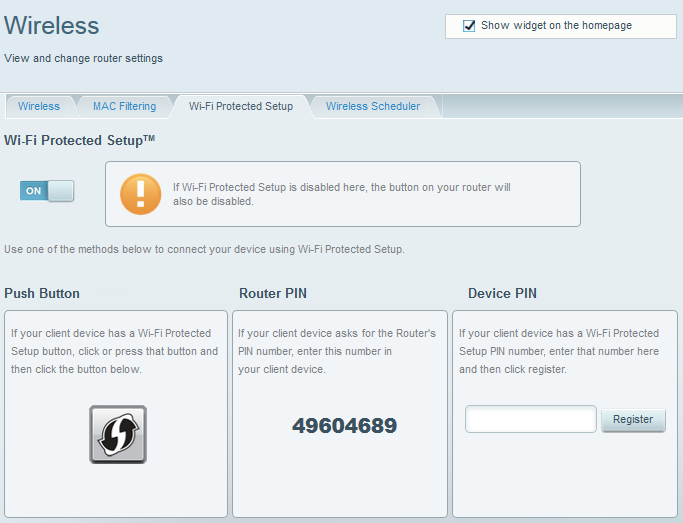 NOTE: If you enable this option, the Wi-Fi Protected Setup™ (WPS) option of your Linksys Smart Wi-Fi will be disabled. To configure the wireless MAC Filter using your Linksys Smart Wi-Fi, click here to learn how. The Wi-Fi Protected Setup™ (WPS) feature makes it easy to add devices to your wireless network without having to enter a wireless network name (SSID) and a password. To use this feature, the wireless device you want to connect must support this functionality. Refer to your device’s documentation if it is specified to support WPS then you can proceed with this setup. QUICK TIP: For instructions on how to connect devices using the Wi-Fi Protected Setup™ (WPS) in your Linksys Smart Wi-Fi, click here. The Wireless Scheduler feature allows you to turn OFF or ON the wireless networks, including the Guest networks, at your preferred time. 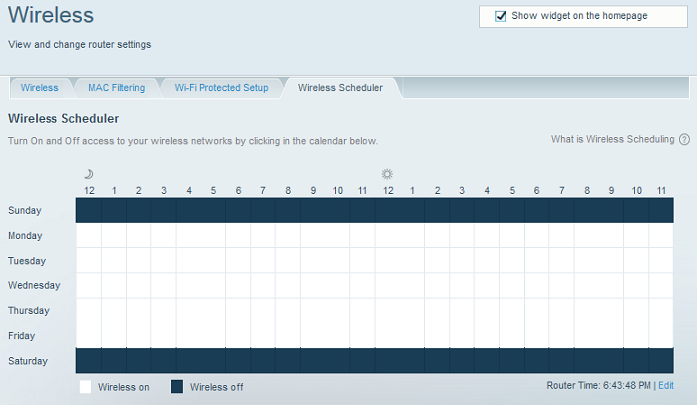 Click on a box or boxes in the calendar to turn OFF or ON your access to the wireless networks. White squares indicate that the wireless networks are ON while the blue squares indicate that the wireless networks are OFF. 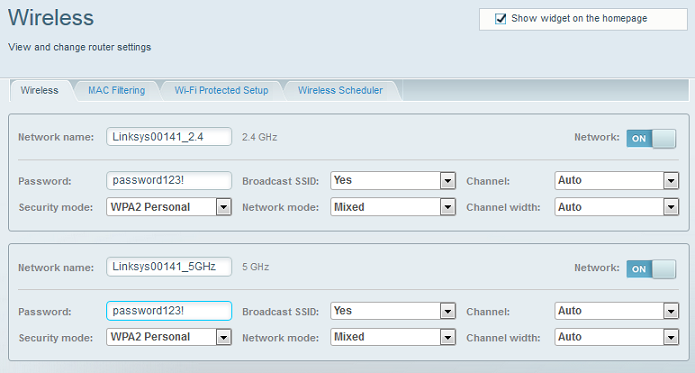 NOTE: The Wireless Scheduler feature is only available on supported routers. Also, make sure that the timezone of your router is accurate so that the Wireless Scheduler applies the correct time setting. To adjust the router's time, check the current Router Time at the bottom-right and click the Edit button. You should now be able to determine which wireless setting you want to define for your network.